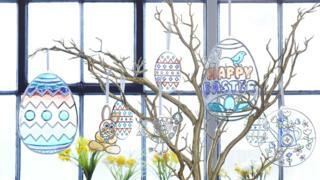 Home » Beading » Hopping Mad Or Festive Fun: Is Easter The New Christmas? There was a time when Easter meant a Sunday roast, strange homemade bonnets, a visit to Church and lots of chocolate. But with shops now offering trees, wreaths and crackers, is it becoming spring’s answer to Christmas? Fresh flowers. White napkins. Fruit tarts. 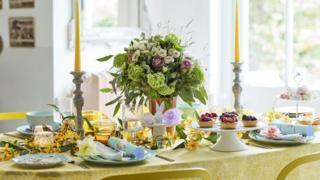 The dinner table for Good Housekeeping’s Easter photo shoot was light, bright, and traditional. But look closely, and there’s something unusual on the plates: sky blue Easter crackers. Carolyn Bailey is homes and garden editor for the magazine. She said more people were buying decorations for Easter than ever before. “Easter is becoming like a second Christmas,” she said. Retailers have hopped on the trend. A number of supermarkets – including Sainsbury’s, Tesco and Waitrose – are stocking Easter crackers this year. Poundland have also got in on the action, offering everything from bunny banners to carrot-shaped fairy lights. 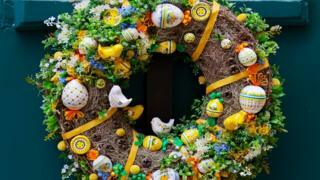 Meanwhile Tesco, M&S and John Lewis are selling egg-speckled wreaths. Can British Easter eggs conquer the world? Eggs are no longer just made of chocolate, but are painted and covered in beads, sparkles or pom-poms. And where do you hang these egg-cellent trinkets? On an Easter tree of course. Varying arrays of twigs – often painted white – are laden with colourful eggs and bunnies. There are more than 16,000 posts for #Eastertree on Instagram and thousands more on Pinterest. And if your garden doesn’t have much in the way of instagram-able branches, a number of high-street stores are selling the skeletal trees ready for decorating. Decorated eggs are not a new phenomenon. House of Faberg set the standard back in 1842. Eggs themselves have been associated with the Christian tradition for even longer. They symbolise both new life and the empty tomb. Canon Sarah Rowland Jones is from the Church in Wales. “In many ways Easter is the more important Christian festival,” she says. “People should be given cause to remember what it’s all about. Easter continues to be the second-biggest retail event in the UK after Christmas. Market researcher, Mintel, estimated Easter to be worth 550 million to UK retailers in 2016. 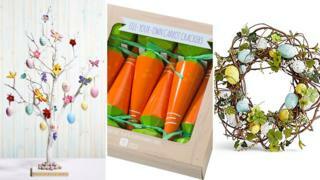 Craft giant, Hobbycraft has seen sales of their Easter range soar almost 44% compared to last year. Included in the range is a faux grass bunny which has completely sold out. Meanwhile, fillable egg characters are up 93% compared to 2016. 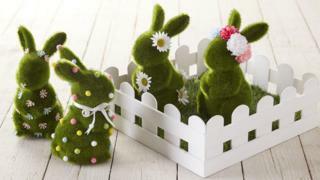 Hobbycraft says “decorating the home for Easter is bigger than ever before” and that homeowners are inspired by crafters like American businesswoman Martha Stewart. Ms Stewart’s online project tutorials currently include “cosmic painted eggs” and “How to fold a napkin into a bunny”.